It is possible to drape a georeferenced TIF image (or any image type) over a 3D map to view it in 3D, provided the image and the 3D map are in the same coordinates. Create the 3D map. Click Home | New Maps | 3D Surface | Surface, select the grid file and click Open. Now let’s drape an aerial image over it. Click Home | Add to Map | Layer | Base, select the georeferenced image file and click Open. As long as the image and the grid file use the same coordinate system and coordinate units, the image is draped appropriately over the 3D surface. If you are adding Base from Server, these images are all in lat/long, so your grid file must also be in lat/long. Now you can change the properties of the 3D surface layer to see the draped image a little better. Select the 3D Surface layer in the Contents window. In the Properties window, click the Overlays page. Change the Color modulation to Use overlay color only. Click the Lighting page, and set the Vertical (degrees) light position to 80. This brightens the map up a bit. If desired, you can eliminate any vertical exaggeration by selecting Map in the Contents window and in the Properties window, clicking the Scale tab. Set the Z Scale to match the X and Y scales. If desired, you can click Map Tools | View | 3D View to view your imagery in true 3D. 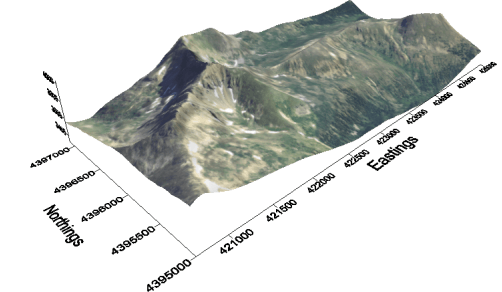 Create a 3D surface map and drape a georeferenced image on top of it.